Table of Contents Next: Watson, Thomas E.
Watson Lakle (128.823W 60.116N) is located in southeastern Yukon Territory, Canada. 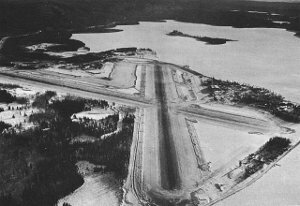 The site was selected in 1939 for a staging airfield along a great circle route from Edmonton to the Orient via Alaska, and engineering survey parties were in the field when war broke out in Europe. The Canadian government elected to finish the survey in case the United States joined the war and made the route of strategic importance, but actual construction did not begin until February 1941. The location was extremely remote: "Materials for Watson Lake moved by steamship to Wrangell, Alaska [-132.374W 56.472N], thence by boat via the Stikine River to Telegraph Creek [131.159W 57.903N], by portage over seventy miles to Dease Lake [129.999W 58.437N], and by boat on the Dease River to Lower Post [128.486W 59.924N]. From the last point they moved over a newly constructed road to Watson Lake" (Dzuiban 1958). The fields were usable by the end of 1941, though facilities were still primitive. Accessibility was greatly improved by the Alaska-Canada Highway and associated pipeline, which passed nearby. U.S. Army engineers took over most of the remaining construction work in February 1943.